The month of August I was the featured artist at the 1875 gallery in Sundance, Wyoming. This building has held many things over the years. It was a bowling alley at one time and a hardware store for many years. The owners have rennovated it (Carefully leaving Mr. Sharps tiny little office) into a gallery, an office space for the museum and a conference room on the ground floor. The second floor is almost finished for a large class room and an apartment. I will get to teach a class up there! My show went amazingly well. I said goodbye to six of my paintings, a print and a lot of pottery. I also sold a painting at the Colored Pencil Society of America show. It has been a great month! A year ago I put in for a show in Gillette, Wyoming at the AVA center. This show will be the month of October. 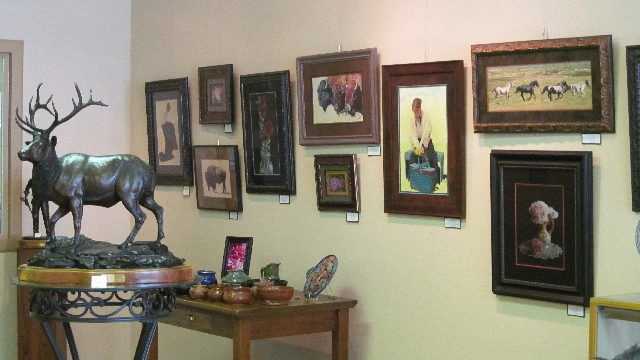 The month of August I was the featured artist at the 1875 gallery in Sundance, Wyoming.